Hello, my name is Andrea and I ♥ AG Dolls! The most 18 inch AG dolls I ever owned at once was 39! The only complete collections I own are GOTY Kanani and McKenna, Lanie is only missing one item. Felicity, Addy, and Kit are in very close runnings, as I only need a few more items. It is very hard to pick a favorite amongst all my girls because I love them in different ways! My hopes for the future is to have complete collections for all the GOTY dolls and the historical collections listed above. Hi Andrea! Welcome, and what a wonderful group of girls you have there! 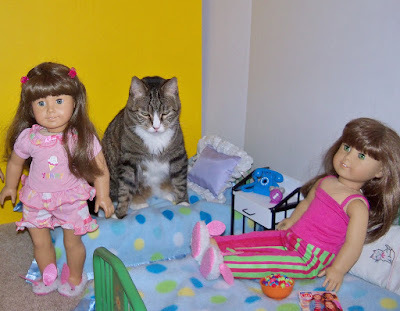 I like your siggy picture with all your dolls! Nice collection .